“Its weird, like, why are so many grown men just obsessed with this 29-year-old, right? On second thought . . .” That’s the Representative from New York’s 14th congressional district, Alexandria Ocasio-Cortez, cracking wise on last night’s Late Night, while talking about the hyperventilating blowhards at Fox News. Telling Seth Meyers that that, let’s call it “news” channel’s now ubiquitous attacks on the first-year congresswoman veered pretty quickly into conspiracy theorist territory, she assured Meyers that, in rebuttal to former presidential candidate, sire of liars, and current purveyor of racist dad jokes Mike Huckabee, she is not a “Manchurian candidate.” Agreeing that she is, indeed, generally a lot more prepared and focused in her substantive questioning of witnesses before congress than many of her colleagues, Ocasio-Cortez attributed her informed zeal to the fact that her office pays its staff a full, living wage in order to help her do her job, rather than Huckabee’s “I’m not sayin’, but I’m sayin’” speculation that she is, um, a brainwashed Commie sleeper agent. “That’s exactly what a Manchurian candidate would say,” responded Meyers, with Huckabee-like shrewdness. 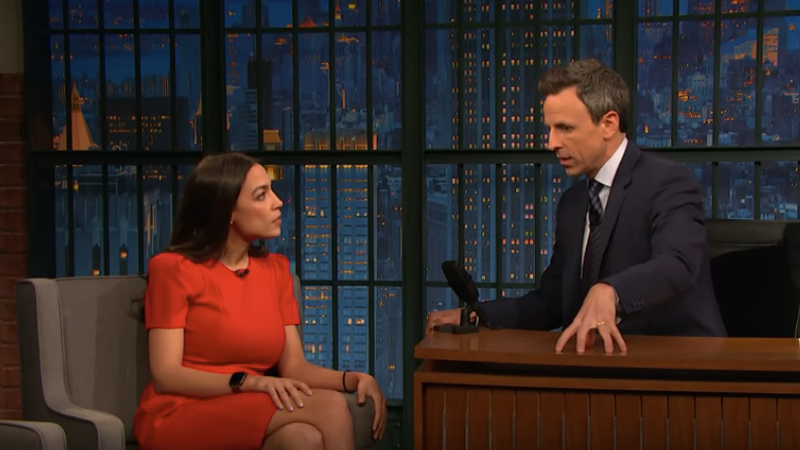 Meyers did note that the congresswoman was a rising star in the Democratic Party, a fact he attributed less to hysterical Red Scare propaganda theories and more to the fact that Ocasio-Cortez has hit the Washington D.C. ground running, brushing off establishment advice to follow “the way things work.” Indeed, Meyers credited AOC’s public popularity to the fact that she and some of the “new wave of people coming to congress” are willing to take out their phones and document some of the heretofore unseen ways in which business as usual is completely and undemocratically fucked. He pointed to the photo Ocasio-Cortez posted online of the practice whereby lobbyists pay homeless people to save their spots in line before committee meetings, so that the industry shills can crowd out the public. “Congressional hearings are not a Beyoncé concert,” suggested Ocasio-Cortez, something to which dedicated C-SPAN viewers can sleepily attest. As to those red-faced white folks at Fox News, the congresswoman did call it “concerning” how the all-white-grievance station’s 24-7 anti-AOC klaxon is affecting the public discourse. She told Meyers she was approached by one of her Republican House colleagues asking if she’d really received a $10 million payout from Netflix (presumably why they cancelled One Day At A Time) during a vote on gun control. “What else do you not know?,” marveled Ocasio-Cortez about an actual elected official of the Republican Party. Of course, the elected official most hyped into a fact-free anti-AOC rage like Bane being injected with pure white supremacy venom is Donald Trump, whose current mischaracterization of AOC’s Green New Deal resolution is daily yowled into and out of the Fox News echo chamber. Telling Meyers the resolution itself is a non-binding set of goals (“a North Star”) to combat climate change and work toward sustainability than restrictive legislation, she also, sighing, went on to debunk some of Trump’s latest MAGA rally hootin’-and-hollerin’ applause lines. You know, like that she wants to ban (checks notes): babies, cows, cow farts, ice cream, planes, cars, and hamburgers, among other things. (No word yet about “hamberders” at press time.) Calling her plan “an overall vision of what we’re trying to accomplish in the next 10 years,” Ocasio-Cortez told Meyers that things like renewable energy, fee public college tuition, healthcare for all, and sustainable technological advances are things to aim for in legislation inspired by the GND mission statement. Somewhere, Mike Huckabee’s sleeper agent sense is tingling.